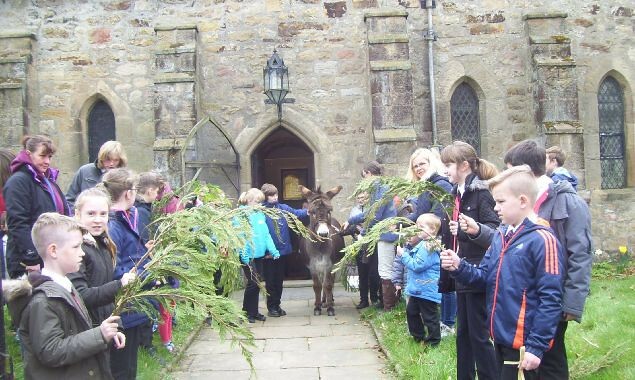 Well RT Hon Horatio Donk is doing his first Palm Sunday parade, apart from they are having it on the Friday before so the school children can all join in. They are going from the school to the church through the village of Bellingham where Donk can graze the churchyard till the service finished then refreshments. Donk will be leading them all think the whole middle school is walking so I do hope he behaves, I woke up last night thinking I hope he dose not poo on the way and all the poor children stand in it then go into church fingers crossed he's a good boy . As Donk is a Right Honourable can you let us know for which constituency he is standing on 8th June so we can vote for him. I am sure he would do a better job than most candidates as he pleases everyone and we all love him. Awww, what a beautiful photo of Donk, hope you don't mind me being familiar Donk but you are too sweet to be so formal. Thanks Firelight I will look at them, it's hard work walking about in boots now the weather is warmer and dry. Well done both of you, bet you had a brilliant time. I have the Ariat Skyline trainer/walking type boots. Very comfy. He is so cute, he needs a new title 'Performance Donkey' now he is doing 'endurance'. Thanks Rui his next adventure is at the end of the month, he's doing a 5km egb ride . So pleased all went well for you after all your hard work. Those children will remember it for the rest of their lives. Well Donk had a lovely morning. I parked in the school car park and got his bridle on, as the children arrived and got in a line he walked down the ramp saw them and let out the biggest bray to say hello to them. He was a little worried about the rustling palm leaves and the fir tree branches . They did however help keep him walking forwards as they were behind him as we walked through the village to the church. While the service was on he stuffed his face with lovely green grass in the church yard. Afterwards it was photo shoots with the children which he loved, all 135 older ones then some tiny torts came to say hello. The vicar is lovely and has a mare and she bred a foal from her which is three now and the caretakers dad competed egb and used to sell endurance saddles and products so we all had plenty to chat about between us all. I think Donk was quite sad to leave. I am not sure I will be able to get any photos as I will be leading Donk at the front with about 135 children behind. There may be somebody there taking photos in which case I will ask for some, I know it's a bit tricky taking photos of other people's children but I can try and get some just of Donk .hes rather hairy and muddy so I will have to give him a good brush tomorrow night. Just to top it off I ha e got a horrid cold so my nose is running like a tap and coughing with no sense of smell or taste, hope it dose not last too long. The weather so far looks good so fingers crossed it stays dry . Photos are a must, please! What a lovely day it will be for all and I am sure the RT Honorable Horatio Donk will will behave in a way befitting his grand title. So pleased to hear that this old tradition is being kept alive. Hope weather is kind and that Mr Donk enjoys the grass.